Multi-platform music creation system for production, performance and DJing! 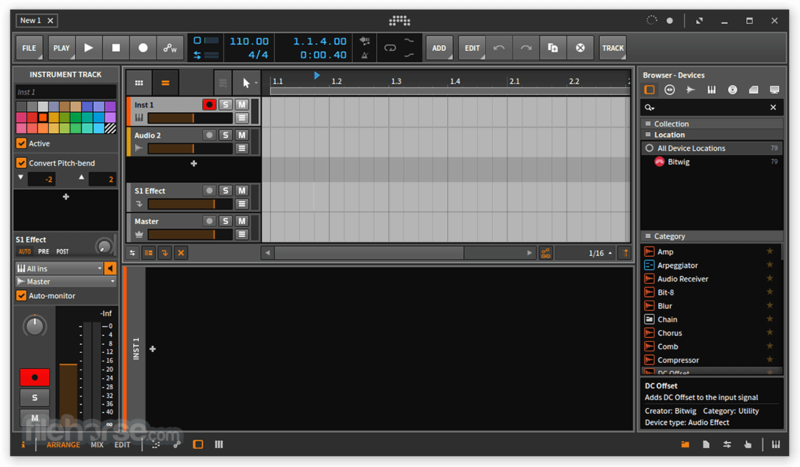 Bitwig Studio is a dynamic software for creation and performance of your musical ideas on stage or in the studio. Discover the new standard in customized workflow. 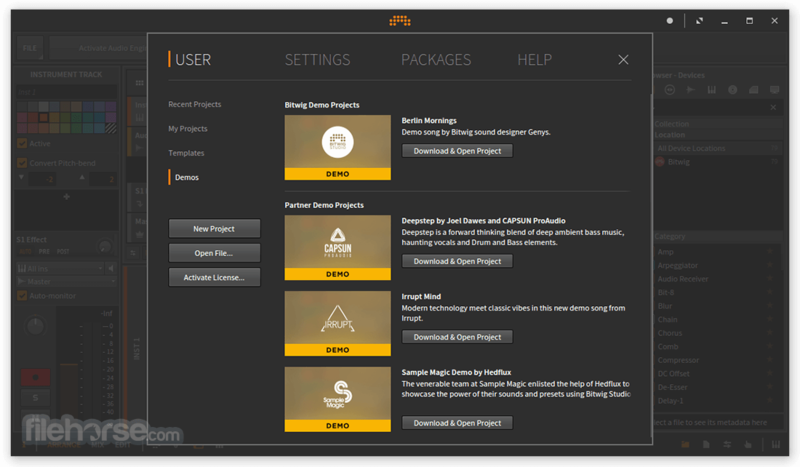 Bitwig Studio inspires you to take greater control of your music, giving you access to every aspect of your production. Streamline your creative process and quickly evolve your ideas into complete songs, tracks and compositions. Record and arrange, improvise and perform, or do it all at once. 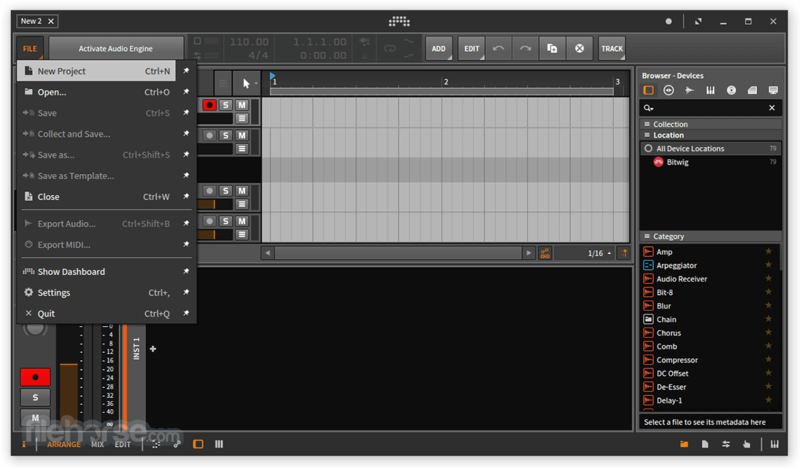 Welcome to the next generation of music creation and performance software for Windows, Mac OS X, and Linux. Bitwig Studio comes loaded with industry-standard to industry-leading features, designed to meet the demands of present day musicians, producers and sound designers. Amazing multi-platform music creation system for production, performance and DJing! Bitwig Studio features a flexible panel based user interface; you have the power to choose what you wish to see depending on task, on up to three monitors. The Detail Editor optimizes audio editing by allowing you to perform non-destructive edits within a clip. This allows you to stretch, split, pitch, pan, copy, reverse, add, move and re-arrange audio as you choose. Edit multiple tracks in the same view, notes using audio as a reference, isolate your view to one clip or expand it to see the everything in the entire track. Besides standard note editing features, and per note expressions such as Velocity, Gain, Pan, Timbre and Pressure, Bitwig Studio features unique tools like micro pitch and sophisticated layered editing, and is a forefront runner in supporting MPE. Device Nesting is a powerful feature for sound design with any combination of Bitwig devices and VST plugins. From Container Devices to FX slots, virtually anywhere you imagine another device could go, it probably will. Nesting Devices means that you can place a device in a device in a device... theoretically, this can go on forever. 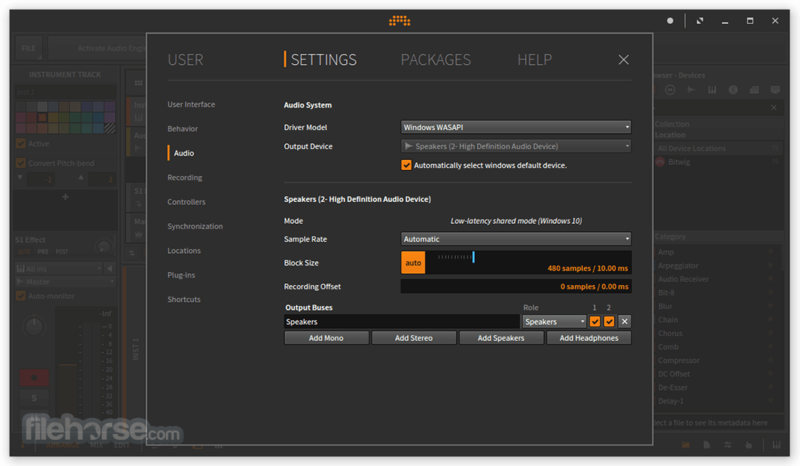 Bitwig Studio plugs right in to your existing setup. With modern software architecture 32-bit and 64-bit VST plug-ins are natively supported, no third-party bridging is necessary to run your favorite plugins side-by-side. Dedicated Hardware Instrument and Effect devices allow you to control your hardware synthesizers, drum machines and effect racks from within your project. Never again will a single plugin take down your entire project. 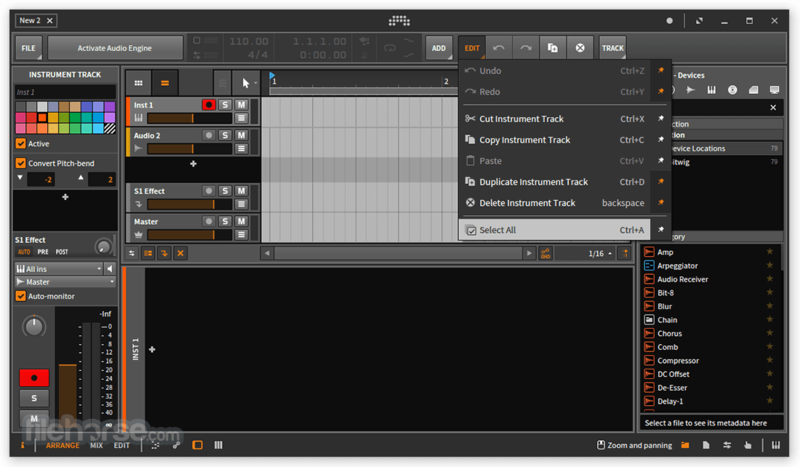 The “sandboxing” feature built-in to Bitwig Studio ensures plug-in crashes will not interrupt valuable production time, or your performance on stage. Bitwig Studio protects your workflow while efficiently running your VSTs for non-stop creativity. The dynamic Inspector panel is a workflow accelerator. It changes depending on where you are and shifts focus with you, to give you easy access to the tools you need. The Inspector allows you to simultaneously edit multiple notes, Events, Clips or Tracks. The Histogram is a feature of the Inspector panel that offers a unique way of working with randomization and variation. Group Tracks is a tried and true way to quickly manage multiple parts of a mix at once. Grouping similar tracks together allows them to be controlled together as a unit and is a great help in organizing your workspace. The Pop-Up Browser makes auditioning and selecting Devices, Presets, VSTs and Samples fast, intuitive and inspiring. With powerful search and filter tools it’s never been easier to locate, or discover the sound you're looking for. Note: In demo version saving and exporting are disabled.